The true business of the school is not to chain the pupil to preconceived ideas, but to set him free to discover his own ideas and to help him bring all his powers to bear upon the problem of learning. The Dalton Science Research Program offers students the opportunity to pursue independent science research within the framework of a formal 4-year process. The research experiences vary widely, with some students pursuing laboratory work at the bench, some doing field-related study, and others taking more transdisciplinary approaches. During the first year at Dalton, all students research an area of their choice in connection with Biology. The DSRP allows students to transition to independent research at an outside institution, usually in the summer between their sophomore and junior years. Previous DSRP scholars have worked at Rockefeller University, Weill Cornell Medical Center, Sloan Kettering, Yale University, and other world-class research centers in the NYC area. Their projects have focused on topics such as the intersection of 3-D printing and cardiology, stem cells and cancer research, the immunology of bone marrow transplants, robotic arms, computational biology, molecular biology, and indoor air quality monitoring. At the invitation of the Dalton history department, students in the Dalton Science Research Program (DSRP) visited Grade 9 history classes to demonstrate some key experiments from the advent of the Scientific Revolution in Europe. I actually worked in two labs, because the graduate student I was working with (Scott Callahan) was doing projects in both labs. Scott's focus was melanomas, primarily their growth. I first started my research in 2014, when I helped a Long Island biologist with a Northern Bobwhite reintroduction project. Over this past summer, I worked in a community lab space to study tardigrades, and most specifically the genes that make them extremophile organisms. Over the summer, I worked at with a neurosurgeon at G. Kuppuswamy Naidu Memorial Hospital in Tamil Nadu, India. I was able to observe surgery, accompany the doctors and nurses on rounds, and complete a data analytics study of the surgeon’s craniotomy results. Last summer I worked in a lab that focuses its research on the effects of stress on memory and the relevant neurological structures. For the past 2.5 years, I have been interning at the Dalio Center of Cardiovascular Imaging at the Weill Medical College of Cornell University. My projects have used 3D printing to study cardiovascular disorders. 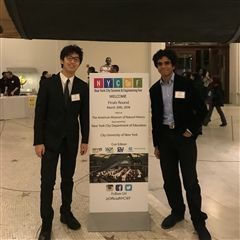 Dalton Science Research Program (DSRP) participants Kevin Won '19 and Eeshan Tripathii '19 submitted their original research to the New York City Science and Engineering Fair. Kevin's poster was titled "Oxidative Stress-Mediated Anticancer Effect of Mushroom Extract on Renal Cell Carcinoma," and Eeshan's was titled "Managing Indoor Air Quality In Child Breathing Zone: Risk Analysis And Mitigation."